You can also attend a town hall to end gun violence and ask small businesses near you to publicly support net neutrality. This week’s Take Action Now focuses on striking teachers in Oklahoma, town halls to end gun violence, and getting small businesses to publicly support net neutrality. 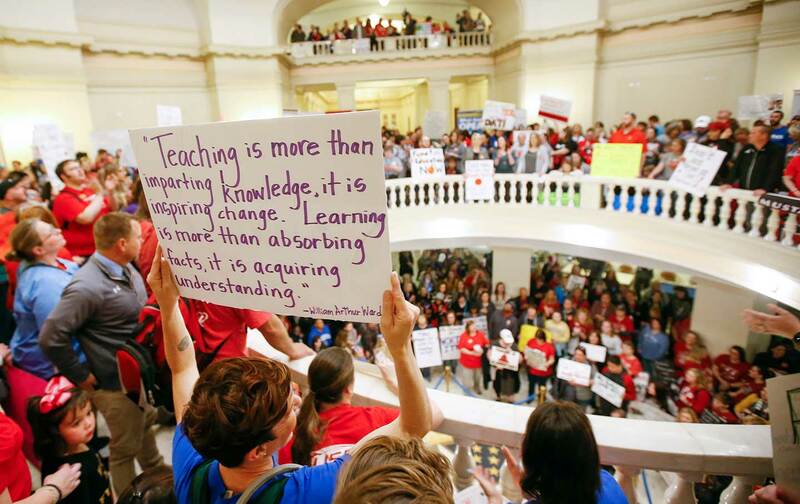 Galvanized by the teachers’ strike that swept West Virginia last month, teachers in Oklahoma are on the third day of a state-wide walk out. Though they are among the lowest paid in the nation, their demands go beyond raises. They also include much-needed funding increases in a state where about twenty percent of schools have had to change to a four-day week and where textbooks are often crumbling and outdated. Follow #Okwalk4kids on Twitter and Facebook, then post a picture or message of support. Last week, the students of Parkland, Florida, partnered with Town Hall Project to ask supporters to organize town halls on Saturday, April 7–and people across the country have answered their call. Find out if there’s a Town Hall For Our Lives scheduled near you, then sign up to attend. Organizers for net neutrality—the concept that all content on the Internet be treated equally—have found support from small businesses to be one of their most effective tools in convincing on-the-fence lawmakers to join their side. Use their tool to find small businesses in your state, then tweet at, write to, or even visit them to ask that they sign a letter in support of net neutrality. And if you own a small business, you can sign the letter yourself here.